Flowers come pre-cut and folded, but not bloomed. Do make these ahead of time if you are using them for party. 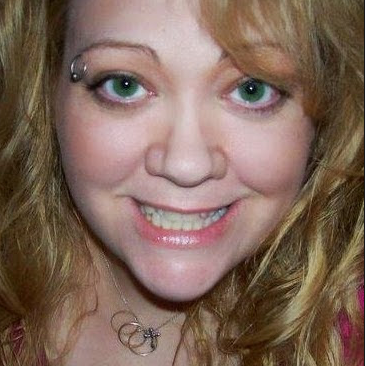 Plan on 5 minutes each for fluffing. Instructions of fluffing included with each package. We strongly recommend you watch our "how to" video. video link is printed on package. 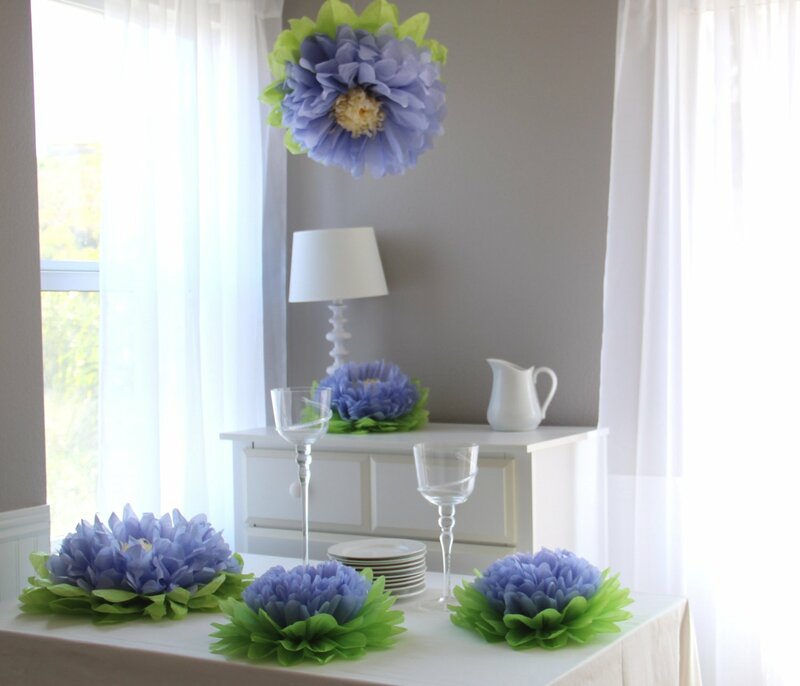 Features: -Attach them to the wall, leave it on dresser, or hang them from the ceiling.-Each flower comes with one fish line for easy hanging.-Flowers come pre-cut and folded, but not bloomed. Dimensions: -Small Tissue Paper Flower: 14" Dia., 0.75 lbs.-Large Tissue Paper Flower: 17" Dia., 1.06 lbs. I was very excited to get to try this set of 7 Paper Flower Poms in the color purple. I just think these paper flower poms are really pretty and make lovely decorations for so many different events. I am really looking forward to using them again and again. I like how they can be used so many different ways. It is nice that they come in a small package, they are packaged individually, each with their set of directions. They are lightweight and can be hung, taped or placed in many different locations. I like that they come is different pretty colors so they can be matched or used as a contrast or accent color for a party. I like that they are easy to use, they are already folded, each just needs to be fluffed. 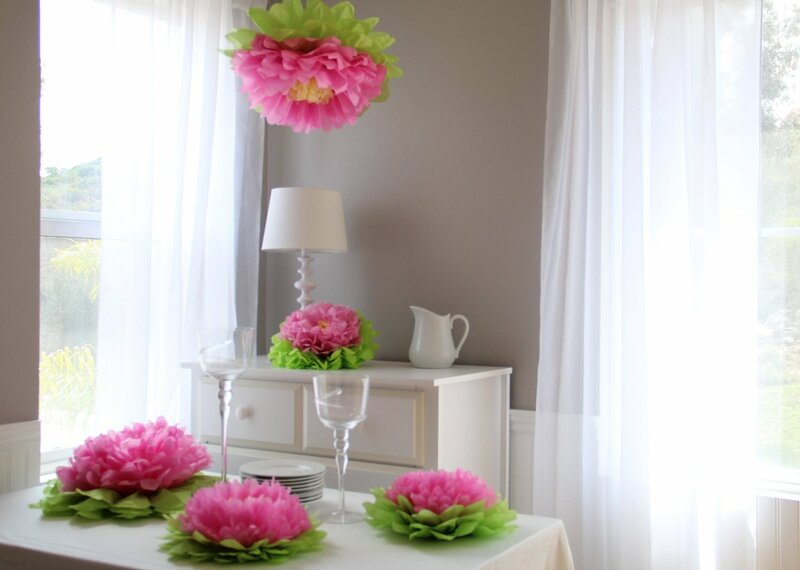 I thought it was pretty fun, fluffing these pretty pom flowers. I like that in case you are unsure as to how to create these pom flowers, there is a how to video link that you can easily follow to insure you get the best results. 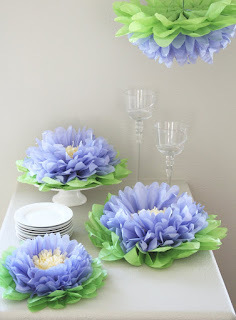 I think these poms would make a beautiful addition to a lot of different kinds of parties and celebrations. I recommend them!